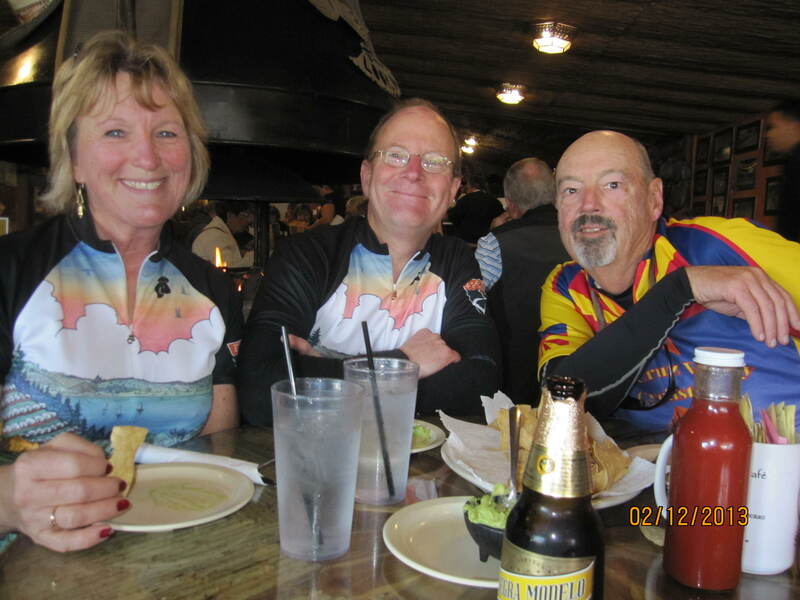 Ridemaster Greg decided that Tuesday’s ride would be to Wisdom’s, a popular Mexican restaurant about 27 miles away. Why? 2 for 1 margarita day, that’s why….I’m sensing trouble. Margaritas at Wisdom’s are served in pint jelly glasses. 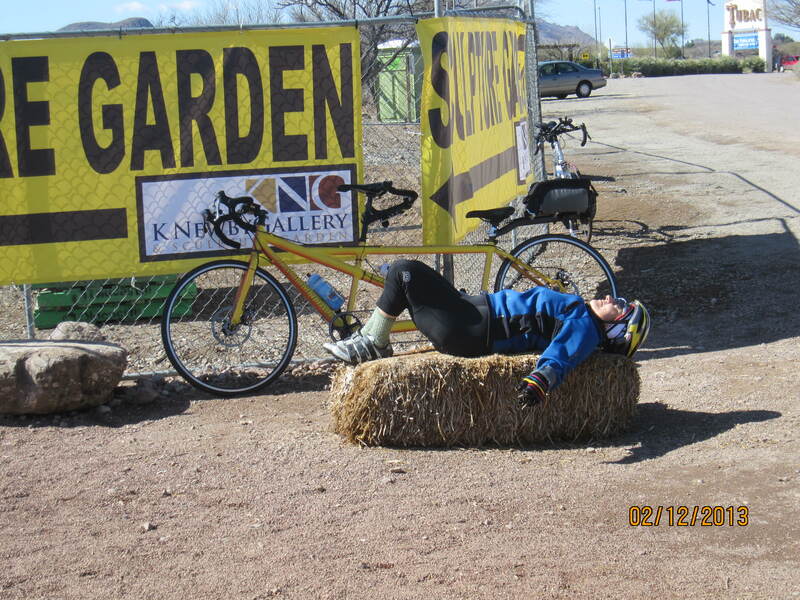 Our ride start was delayed by an hour, because of the unusually cold temps here in Green Valley. 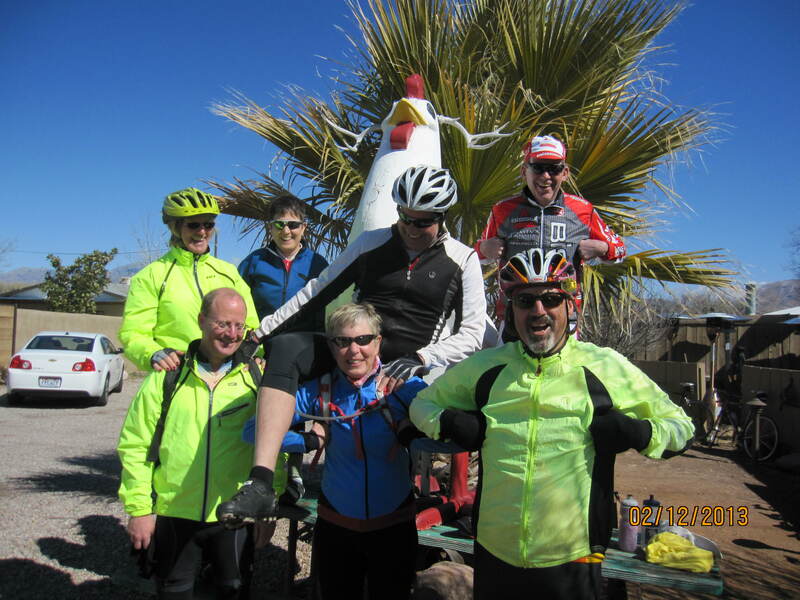 By the time we actually hit the road around 10:30, the thermometer had crept up to the high 30’s, so we bundled up & took off – into a headwind, naturally. We slogged our way down to Wisdom’s, getting the last two tables (for the 8 of us). The margarita crowd took one table (Marty, Geri, Greg, Caroline), and the beer/pina colada group (Linda, Rick, John, me) took the other. They were definitely the noisier of the two. 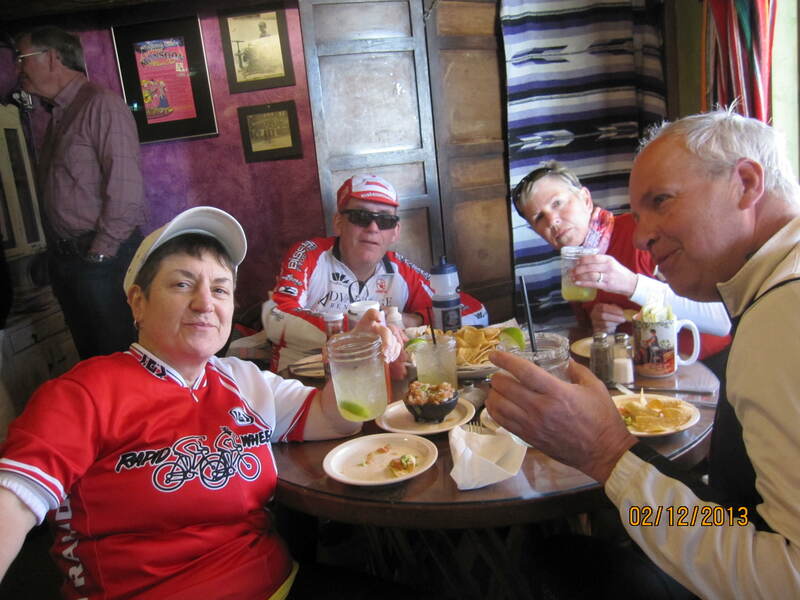 Food was pretty good – they slurped up dessert burritos with the last of their margaritas. Check paid – out the door. Trouble begins immediately. The unruly group gave me a bunch of flak about posing with the Wisdom chicken for an official photo. Also, as is our usual luck, our headwind down had turned around, and was now a headwind from the north, adding misery to the trip. It hadn’t warmed up too much, being only in the low 40’s by this time. before putting our heads into the wind and trying to pedal our way home. We all made it, but John and I didn’t walk into our house until 4:30! A whole day! Where does it all go? 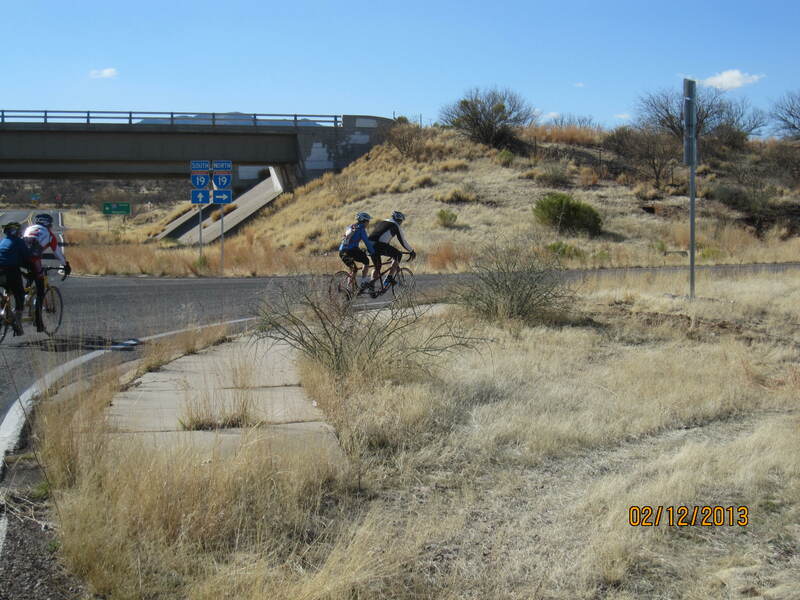 we have to ride on the Interstate for a brief section. 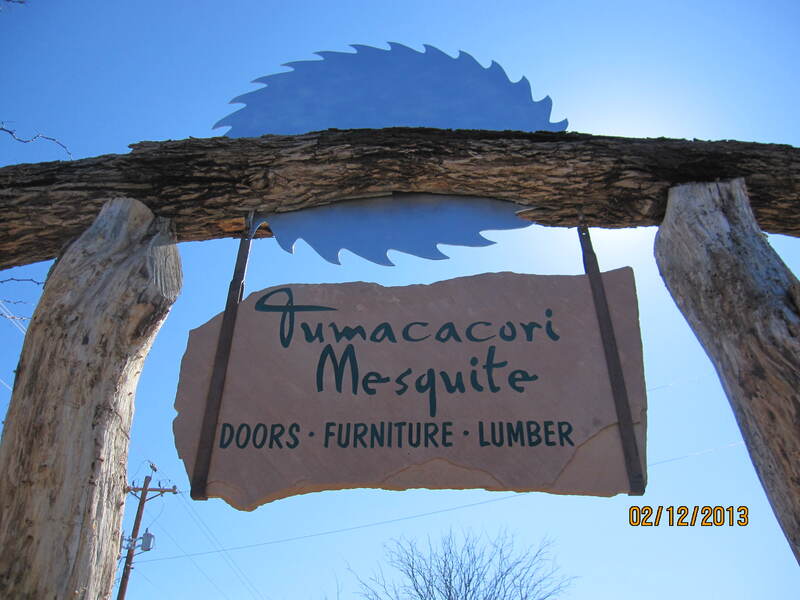 Is Tubac still as boring as I remember it? You guys are having entirely to much fun! Wish we could be there. Too much fun? Is that even possible? Please send us pints of Margarita here in Michigan!